What’re the most atmospheric weather conditions under which to endure a zombie attack? Fog has them lurching from the white at an uncomfortably close draw distance. A no-brainer, as it were. But then, blazing sunshine offers that horrible juxtaposition of death and the domestic that the Walking Dead excels at. Luckily, sandbox shooter H1Z1 can do both, and plenty in between. SOE programmer Ryan Favale’s had rain, clouds, surface wetness and a host of other weather systems working for a while now – and is currently finishing up dynamic snow which forms and melts according to temperature, humidity and wind. SOE are in the process of shifting weather control from player PCs to H1Z1’s servers. That’s not so that they can enact Truman Show thunderstorms with the flick of a dial, but rather to ensure an even playing field. It’s Favale’s job to ensure everybody is “playing the game on the same page”. If hackers can turn off fog and rain effects, goes the thinking, they can enjoy a significant advantage over their survivalist peers – and that won’t do. Weather concessions for low-end systems are being designed with the same ethos – Favale says they’ll have “very comparable impact” on play to the more visually impressive storms on high-end PCs. 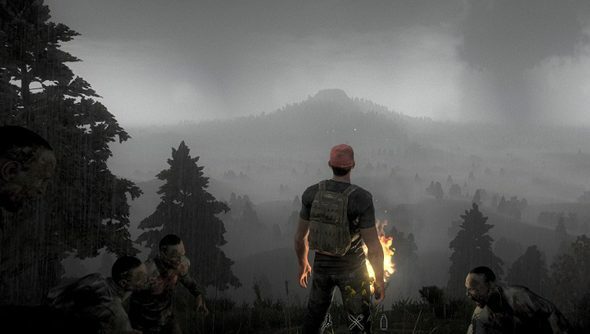 There’s a question mark over whether dynamic snow will make it into H1Z1’s first early access release – but eventually the game will be subject to a powerful server controller which manipulates where overhead clouds form, the angle of the sun, the direction of rolling fog, and possibly even extreme visual events like dust storms and meteor showers. SOE are building H1Z1 on Planetside 2’sForgelight engine, which means the dev team began with plenty of environmental tools to draw upon. Do you expect to be playing H1Z1 in the office? It’s difficult to gauge just how sold SOE’s public are on their survival shooter.